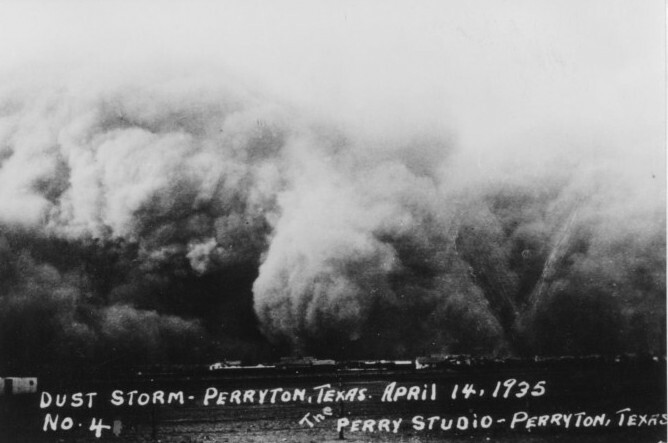 Residents of Perryton, Tex., where there have been 50 dust storms in 104 days, described the storm "as the worst in history." Old-timers in Oklahoma and Kansas agreed. After the main cloud had passed, the air still was full of dust. The haze spread out far to the east and west. At Trinidad, Colo. Santa Fe railroad officials detoured trains over a southern route in a effort to avoid the storm. By 24 March  southeastern Colorado and western Kansas had seen twelve consecutive days of dust storms, but there was worse to come. Near the end of March a new duster swept across the southern plains, destroying one-half the wheat crop in Kansas, one-quarter of it in Oklahoma, and all of it in Nebraska—5 million acres blown out. The storm carried away from the plains twice as much earth as men and machines had scooped out to make the Panama Canal, depositing it once again over the East Coast states and the Atlantic Ocean. Then the wind slackened off a bit, gathering strength, as it were, for the spectacular finale of that unusual spring season—Black Sunday, 14 April. I lived six miles southeast of Farwell, Texas. The worst [dust storm] I remember occurred when I was about four years old. I still remember that day. I can replay scenes now in my mind. I did not sense fear but awesomeness. It was something you experience. I can describe it but you miss the awesomeness of the whole thing. The sand got pretty close to us before the wind started. The front was just a few miles away when the wind got very strong. I remember seeing a mother hen and her little chickens in the yard. she was trying to get all her chicks under her wings to protect them. She knew danger was at hand. She finally succeeded getting them all hidden under her fluffed-up feathers. That seems to be a very intelligent mother hen except she made one big mistake. She turned her back to the wind and it caught her feathers. She and the little chicks went flying across the yard. I do not know if my parents ever found them. Most of the chickens would have been blown away but most all of them went to roost in the chicken house. The reason was probably because it became so dark they thought it was night. 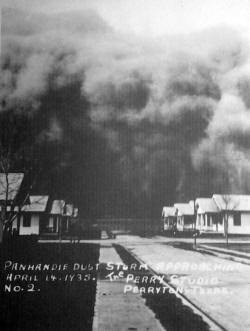 The worst dust storm in the memory of the oldest inhabitants of this section of the country hit Perryton at five o'clock Sunday afternoon, catching hundreds of people away from their homes, at the theatre, on the highways, or on picnic parties. The storm came up suddenly, following a perfect spring day. In just a few minutes after the first bank appeared in the north, the fury of the black blizzard was upon us, turning the bright sunshine of a perfect day into the murky inkiness of the blackest night. Many hurried to storm cellars, remembering the cyclone of July, two years ago, which followed a similar duster. Without question, this storm put the finishing touch of destruction to what faint hopes this area had for a wheat crop. 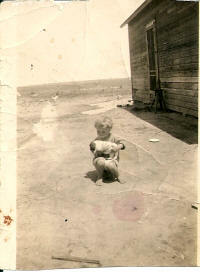 Business houses and homes were literally filled with the fine dirt and silt driven in by this fifty mile an hour gale. The storm started in the Dakotas and carried through with diminishing fury into Old Mexico. Borger reported the storm struck there at 6:15 p.m.; Amarillo at 7:20 p.m.; Boise City, Oklahoma, at 5:35 p.m.; and Dalhart at 5:15 p.m. Some People Thought the End of the World was at Hand when Every Trace of Daylight was Obliterated at 4:00 p.m.
A people who during the past two weeks thought they had experienced the worst that could come in the form of dirt storms, looked on in awe and many of them in terror yesterday afternoon when...a great black bank rolled in out of the northeast and in a twinkling when it struck Liberal plunged everything into inky blackness, worse than that on any midnight, when there is at least some starlight and outlines of objects can be seen. When the storm struck it was impossible to see one's hand before his face even two inches away. And it was several minutes before any trace of daylight whatsoever returned. The day up to that time had been one of the few pleasant ones of the past several weeks. There had been no clouds in the sky. The temperature was unusually high and the day was one inviting people into the out of doors after day after day of dust. North winds whipped dust of the drought area to a new fury Sunday and old timers said the storm was the worst they'd seen. Farmers prayed through dust filmed lips for rain. A black duster—sun blotting cloud banks—raced over Southwest Kansas, the Texas and Oklahoma Panhandles, and foggy haze spread about other parts of the southwest. Easter services at Lindsborg, Kansas, opening with a chorus singing "The Messiah" were carried on in dust-laden air. The black duster made the 105 miles from Boise City, Okla., to Amarillo, Texas, in 1 hour 45 minutes. Hundreds of Sunday motorists lured to the highways by 90 degrees temperatures and crystal clear skies were caught by the storm. Farmers and agricultural officials of the dust area, Southwest Kansas, Southeast Colorado, Northeastern New Mexico and the Texas and Oklahoma Panhandles, reported the soil was not damaged and that crops could still be made this season if it would rain. Governor Alf M. Landon of Kansas pointed out top soil ranges from 10 to 30 feet deep at many points in the area. Blotting out every speck of light, the worst duststorm in the history of the Panhandle covered the entire region early last night. The billowing black cloud struck Amarillo at 7:20 o'clock and visibility was zero for 12 minutes. Gradually it cleared and Weatherman H. T. Collman said the storm would be over by morning. The black, ominous cloud rolled over the Panhandle from the north, an awe-inspiring spectacle. The storm continued southward and had moved into Wichita Falls by 9:45 o'clock, the Associated Press reported. A large area west and southwest of Temple was reported feeling effects of the duster, which moved onward into South Texas. Warning of the terrible storm reached Amarillo about 45 minutes before it struck. It came from a woman in Stinnett. The woman called Sheriff Bill Adams. He did not learn her name. "I feel that you people of Amarillo should know of the terrible duststorm which has struck here and probably will hit Amarillo," the woman said, "I am sitting in my room and I cannot see the telephone." A gentle, north breeze preceded 8,000-feet-high clouds of dust. As the midnight fog arrived, the streets were practically deserted. However, hundreds of people stood before their homes to watch the magnificent sight. Darkness settled swiftly after the city had been enveloped in the stinking, stinging dust, carried by a 50-mile-an-hour wind. Despite closed windows and doors, the silt crept into buildings to deposit a dingy, gray film. Within two hours the dust was a quarter of an inch in thickness in homes and stores. Reports from the north at 10:30 o'clock last night by the Santa Fe dispatcher said that the moon could be seen at Woodward, Okla., showing that the storm was clearing rapidly. The weather forecast for today was partly cloudy and colder. The storm struck just before early twilight. All traffic was blocked and taxi companies reported that it was difficult to make calls for nearly 45 minutes. Street signal lights were invisible a few paces away. Lights in 10 and 12 story buildings could not be seen. John L. McCarty, editor of the Dalhart Texan, of Dalhart, the center of the drought-stricken area of the Panhandle, called a few minutes before the storm arrived in Amarillo. The storm struck Dalhart about 85 minutes before it hit Amarillo and the city remained in total darkness for more than that length of time, he said. "I went outside the house during the storm and could not see a lighted window of the house three feet away." Mr. McCarty said. Borger, Perryton and other cities on the North Plains reported similar conditions, proving that the storm was becoming less vicious the farther south it moved. Damage to the wheat crop, already half ruined by drought and wind, could not be learned last night, but several grainmen believed that the dust would cover even more of the crops. The storm started yesterday when a high pressure area moved out of the Dakotas toward Wyoming, according to Mr. Collman. Most of the dust was from western Kansas and Oklahoma, he said. A linotype operator, forced to stick to his post in a dusty shop appeared with a narrow strip of shoe shining cloth, lined with sheepskin, tied close to his nostrils. When dampened, he said, it made breathing normal. A Santa Fe freight train, scheduled to depart from the South Plains about 8 o'clock, was held up nearly an hour waiting for the dust to subside. With improved visibility by 11 o'clock it was reported making good time, aided by a strong "tailwind." GUYMON, Okla., April 14 (AP)—Another dust storm, even more severe than those which enveloped the Oklahoma Panhandle last week, turned daylight suddenly into darkness here late this afternoon. Earlier, worshipers had gathered in a church and prayed for rain. Clouds soon appeared, but quickly vanished. Motorists who had taken advantage of a clear, pretty day to drive into the countryside were believed trapped in the deluge of silt, which rolled and boiled like the smoke from a gigantic oil fire. At times, one could not see his hand before him on Main Street here. In the worst of the onslaught, lights could not be seen through the dirt-filled air. As the blinding cloud swept in from the north, motorists drove toward home at full speed. Breathing was extremely difficult out of doors, and it was impossible to find one’s way about. Outlines of buildings seen across the street, dim at best, would disappear at times, and the few business houses open were crowded with those lured into the open by a beautiful day. As alarm of the approaching storm spread through the town, hundreds of cameras were made ready and put to use when it struck. LIBERAL, Kans., April 14 (AP)—The worst dust storm in history brought premature and complete darkness to this city in midafternoon today. The weather was delightful thirty minutes previous. Swirling in suddenly from the Southwest, the storm struck during a funeral at a local church, putting the crowd into a panic. Three people fainted as the dust swept inside the church. Long distance telephone wires are reported out of order and the weather turned colder tonight with the storm still raging. [Photo caption] Leland Fox, 10, his step-sister, Corinne Weeden, 10, and their dog passed an entire night by this thistle and dust-clogged fence row in vicinity of their home near Hugoton, Kans. They became lost while hunting in a field for arrowheads. Some 100 persons joined in the searching party. After a night in the storm, punctuated by coyote howls, Leland made his way to aid. BOISE CITY, Okla., April 14 (AP)—Old timers say it’s the worst storm to his this part of the country, dust ridden though they’ve been in recent weeks. The cloud caught us, Staff Photographer Harry Eisenhand and I, on the highway about six miles north of town. We first noticed it about nine miles out. Rain seemed to be coming. Then it resolved into a dust formation. "What a swell picture," Harry said. We stopped at a knoll, took several pictures, then turned the car around for flight. The great cloud of dust rose a thousand feet into the air, blue gray. In front of it were six or seven whirling columns of dust, drifting up like cigar smoke. We went down the road about 60 miles an hour to keep ahead of it. We had seen an old couple at a dilapidated farm house, and stopped there to warn them, but they had already gone. Speeding on, the car was suddenly engulfed by a flank movement of the cloud. Momentarily the road glimmered ahead like a ribbon of light in a tunnel, then the dust closed it. It became absolutely black as night. We slammed on the brakes and turned on the car lights. Exploring by touch, we found the car in a dust drift. Backing out and keeping a door open to watch the edge of the highway, we took two hours to move the remaining six miles into Boise City. En route we picked up Jack Atkins of Hunter, Colo., his wife and three children from their stalled car. "Without doubt," said Atkins, "this is the worst blow that ever hit this section." Undoubtedly hundreds of cars were stalled throughout the area by the dust, seemingly semi-solid in the darkness. Lights can barely be seen across the street. It took the storm just one hour 45 minutes to travel the 105 miles airline from Boise City to Amarillo, Texas. The funeral procession of Mrs. Loumiza Lucas, enroute from Boise City to Texhoma, Okla., was caught eight miles out and forced to turn back. Mrs. Lucas was the mother of Fred Lucas, well known Texhoma rancher, and E..W. Lucas of Boise City. Half a dozen small boys and girls sought by police as missing were found to have been lost on the way from their home—they started when skies were clear—to a drug store. Residents of the southwestern dust bowl marked up another black duster today and wondered how long it would be before another one came along. Already cheered by two days of clear skies and a respite from the choking silt and sand, they were enjoying what started out to be a balmy Sunday when the duster swept out of the north over western Kansas and eastern Colorado, and rushed on over the Oklahoma Panhandle and into Texas. Hundreds of Sunday motorists were caught when the dense black cloud bore down upon them at a rate of 60 miles an hour. Some Oklahomans rushed for their storm cellars as day was turned into night. Many motorists who attempted to drive through the cloud of stinging gravel and sand, found that static electricity, generated by the dust particles, had disrupted the ignition systems of their engines.